There are two ways to approach health and wellness. The first is to reduce the risks of poor health. That is – stop smoking, lose weight, eat a nutritious diet, get exercise ... and the list goes on and on. Then there's the school of thought pertaining to "salutogenesis," or the pursuit of positive interactions. The distinction may be small, but some wellness experts believe it's significant. Salutogenesis emphasizes factors that support wellness health, rather than factors that cause disease. In other words, what are things that make a person happier? If you can consistently replicate those factors, you may increase the likelihood that each person will lead a healthier lifestyle. The distinction reminds me of the old adage that happiness isn't a destination, it's a journey. So instead of taking a medical approach to employee health and eliminating or reducing negative factors, perhaps we should take a more positive approach. For example, if a person is happiest spending time with his family, or training to run a marathon, or just rocking in a hammock reading the latest best seller, then this might be an integral part of that person's wellness program. When you are able to enjoy these pursuits, you may experience less stress and anxiety – two dynamics that tend to exacerbate poor health factors. When you encourage people to work towards their potential in each of these six categories, what might that mean? It could mean having more time – to get more training and/or education to help their career aspirations, to exercise more, or spend more time with friends. Perhaps it means more resources, such as a corporate fitness club membership, a babysitter a few hours on the weekend, or transportation to be able to shop for fresh produce. Or, to reach spiritual or emotional goals, people may need to consult with professional resources – a therapist, social worker, or clergy member. The point is, the route to workplace health may not be to lower blood pressure by taking medication. It may be to reduce the stress caused by dealing with an angst-ridden teenager and/or a frail, elderly parent trying to hang onto to the last vestiges of independence. This may require actual personal resources, but in many cases it may simply be helpful for a person to have someone to talk to who understands these situations or is experiencing them as well. 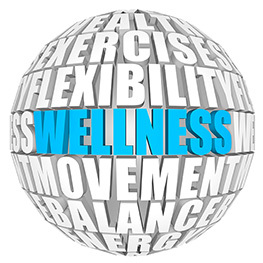 One of the most effective ways to develop a workplace wellness program is to recognize that the root of a health problem is not always medical in nature. People engage in destructive behaviors such as over-eating or drinking too much as a means of coping with whatever is going on in their lives. It's the "whatever is going on" that is the root cause – not being overweight. If you don't get to the root, any solution you implement is likely to be only temporary. Simply understanding these factors of salutogenesis can go a long way to helping people move towards wellness behaviors and improving corporate health. Losing weight, stopping smoking, or giving up a nightly drink after work can be hard enough to do, but when you're still facing the same stress triggers – a teenager missing his curfew, mom calling because she can't find her reading glasses, or the washing machine continually malfunctioning and knowing you don't have the money to replace it – can make giving up these vices nearly impossible. Identifying and addressing the true root causes can help each of us achieve a higher state of wellness in all areas of our life.